The She-Hulk “Fogler v Rogers” courtroom drama focused on Daredevil representing the estate and family of an American who collaborated with Nazis, most likely convicted for treason, suing Steve Rogers for the death of Sam Fogler (the deceased plaintiff’s brother) in 1940. Granted, the evidence that the deceased Plaintiff was convicted for treason never came out during the trial due to the information being classified was a small wrinkle is an otherwise good defense for a nonsuit. It is a rare day to see a comic book storyline focus on a trial. Sure, it skipped discovery and motion practice. That being said, it was three issues focused on a wrongful death lawsuit. It can be forgiven for not following Professor Thomas Mauet’s Fundamentals of Trial Techniques. Trial Procedure: Who Called Captain America to Testify? Normally in a trial, the Plaintiff presents their case, followed by the Defendant. The procedural flow for testimony of a witness is direct examination, cross-examination, redirect examination, recross-examination, and continuing thereafter by redirect and recross-examination. Cal Evid Code § 772(a). In the story, it appeared the Plaintiff called Defendant Steve Rogers to testify during the Plaintiff’s case-in-chief. Was this proper, or did Murdock need to wait and cross-examine Steve Rogers during the Defense’s case-in-chief? Matt Murdock was within his right to call Steve Rogers to testify during the Plaintiff’s case-in-chief, because “[a] party to the record of any civil action, or a person identified with such a party, may be called and examined as if under cross-examination by any adverse party at any time during the presentation of evidence by the party calling the witness.” Cal Evid Code § 776(a). There are best practices for direct examinations: The lawyer only does 10% of the talking with questions to the witness; the witness does 90% of the talking by telling their story. Most times this is done chronologically to make sense for the jury and for foundation. Questions may not be leading on direct examination. Cal Evid Code § 767. After direct examination, there is cross-examination, where the adverse party questions the witness. Here, the lawyer does 90% of the talking with leading questions. Cal Evid Code § 767. The attorney exercises as much witness control as possible and above all else, avoids questions that start with “why,” to keep the witness from explaining away issues. Redirect can follow, where the attorney can ask question to rehabilitate the witness if there were any attacks on their credibility during cross-examination. The Estate of Harold Fogler does not have to prove the exact amount of these damages. However, you must not speculate or guess in awarding damages. The damages claimed by Estate of Harold Fogler fall into two categories called economic damages and noneconomic damages. 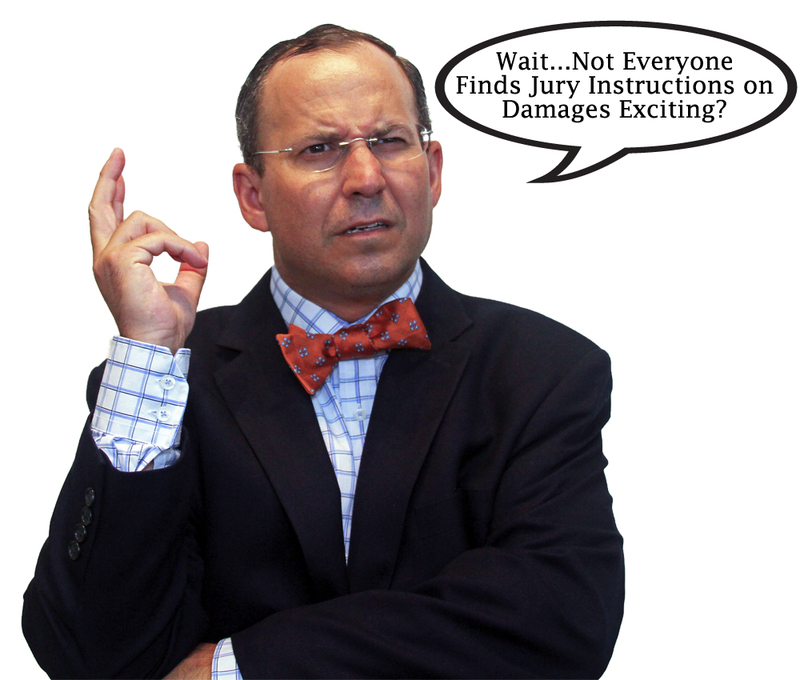 You will be asked to state the two categories of damages separately on the verdict form. The reasonable value of household services that Samuel Fogler would have provided. The loss of Samuel Fogler’s training and guidance. No fixed standard exists for deciding the amount of noneconomic damages. You must use your judgment to decide a reasonable amount based on the evidence and your common sense. For these noneconomic damages, determine the amount in current dollars paid at the time of judgment that will compensate Estate of Harold Fogler for those damages. This amount of noneconomic damages should not be further reduced to present cash value because that reduction should only be performed with respect to future economic damages. The poverty or wealth of the Estate of Harold Fogler. In deciding a person’s life expectancy, you may consider, among other factors, the average life expectancy of a person of that age, as well as that person’s health, habits, activities, lifestyle, and occupation. According to Worldbank.org, the average life expectancy of a male in the United States is 79 years in 2014. This published information is evidence of how long a person is likely to live but is not conclusive. Some people live longer and others die sooner. In computing these damages, consider the losses suffered by all plaintiffs and return a verdict of a single amount for all plaintiffs. Damages would be highly difficult to determine, because the decedent died in 1940 (Nor would you use Worldbank.org). There was no guarantee Sam Fogler would have lived until his 90s and could have very well been killed during World War 2 if he had survived trying to save his brother Harold in 1940. Moreover, according to the Social Security Administration in 1930 the average life expectancy was only 58. Furthermore, in 1940 only 53.9% of males in the United States survived to age 65, according to the Social Security Administration. Courts have instructed juries on life expectancies to consider “the age, state of health and respective life expectancies of the deceased and each plaintiff but should be concerned only with “the shorter of the life expectancies, that of one of the plaintiffs or that of the deceased. . . .” Francis v Sauve, 222 Cal App 2d 102, 120-121 , citing Redfield v. Oakland Consolidated Street Ry. Co. (1895) 110 Cal.277, 287 [42 P. 822, 1063]. Determining the “just” damages from the circumstances of the case would require evidence of mortality tables from World War 2 to determine the deceased’s life expectancy for damages. If a jury determined that Samuel Fogler might only have lived until 1943, that would be the shorter life expectancy to consider for damages, instead of Harold Fogler’s long life. Sam Fogler was studying to be a doctor, but he was not one when he died. It is speculative that he would have graduated medical school, completed residency, and passed his medical boards. As such, determining how much income Sam Fogler would have made is highly speculative, thus could require the jury to actually have evidence of Sam Fogler’s grades in determining whether to consider Sam Fogler’s employment goal in awarding damages for lost income. Another significant oddity would be grandnephews and grandnieces bringing a lawsuit for a granduncle who died decades before they were born. While it would be equally strange for an estate to bring a wrongful death suit for someone else who died decades before, in either case, damages would be complicated. Why Not a Freedom of Information Act Request to Impeach Harold Fogler? Steve Rogers refused to answer specifics on why there were no official reports of Nazis involved in Samuel Fogler’s death due to the events in 1940 being classified. 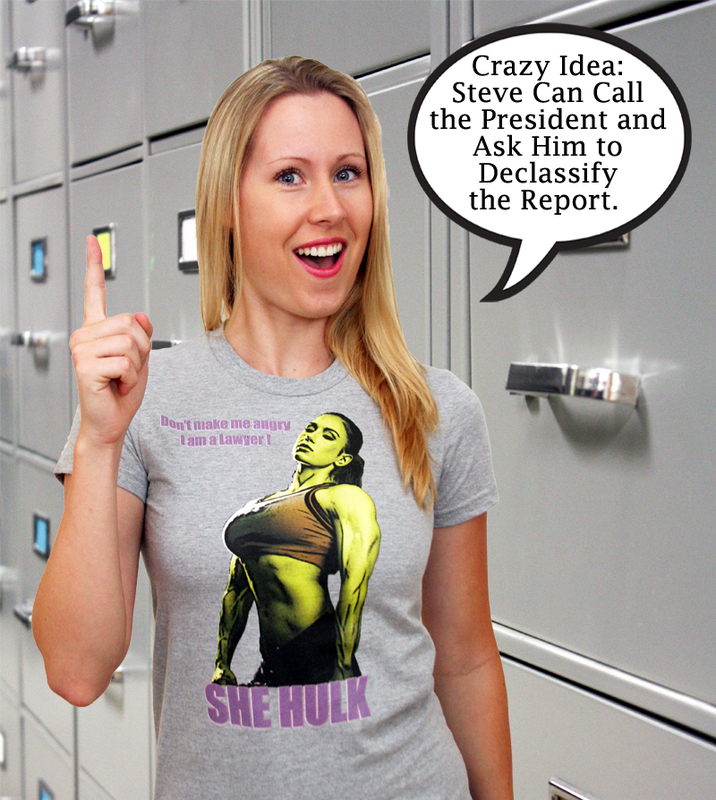 Steve Rogers should have disclosed this information to She-Hulk when she took the case, because they could have filed a Freedom of Information Act Request for the report that Hellcat stole for Steve Rogers. 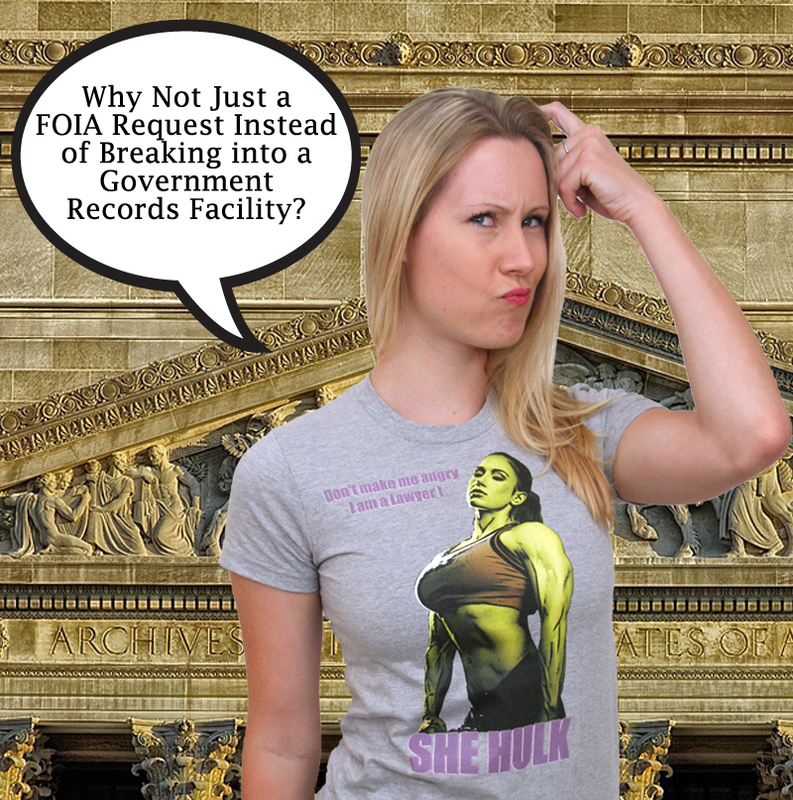 There was no reason to have Hellcat steal the file (other then there is zero action in filing a FOIA request compared to Hellcat breaking in to a government facility). While it could have taken time for the FOIA request to be processed, it would be extremely unlikely the report would still be classified for events that took place in 1940. In present day, we know German U-Boats operated extremely close to US cities. Moreover, even in 1945 there were trials over whether a German immigrant committed treason for meeting with a German friend who illegally entered the United States by U-Boat to commit acts of sabotage. Cramer v. United States, 325 U.S. 1 (U.S. 1945). Another option would be for Steve Rogers to call the President of the United States and ask for the file. Begin the conversation with, “Remember all the times I saved civilization? You know, from Nazis, the Kree-Skrull War, and Thanos? Yes, I need a report from 1940 to rebut evidence in a civil lawsuit. Can you help me out?” Unlikely any POTUS would say no. The file would likely be hand delivered by the Attorney General. The National security concerns of 1940 would not prevent a FOIA request from being granted to Captain America as a defense in a civil lawsuit by someone who provided aid to Nazis on US soil in 1940. The information about the Nazis operating in Los Angeles could also be used to impeach the credibility of the improperly admitted dying declaration of Harold Fogler. California Evidence allows a party to attack the credibility of witness. Cal Evid Code § 785. One way to attack credibility of a witness is to show the witness was convicted of a felony (and in California it is any felony conviction). Cal Evid Code § 788. Impeaching a witness with convicted felonies that show the “former offender is a present prevaricator” are very powerful. People v Heckathorne, 202 Cal App 3d 458, 464-465, 248 Cal Rptr 399, 402-403 . Felonies such as treason, theft, and perjury bear a “rational relationship to credibility.” Id. The fact Harold Fogler went to prison for his actions with the Nazis, which most likely would have been for treason, would have been extremely useful in impeaching the credibility of the Plaintiff’s claims against Steve Rogers. These facts would also completely carpet bomb the Plaintiff’s case into a nonsuit for trying to collect damages that originated from the deceased’s treasonous conduct in 1940.